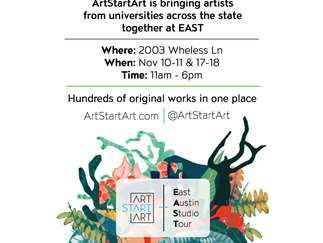 ArtStartArt (ASA) is thrilled to participate in this years East Austin Studio Tour (EAST). For two weekends in a row, shop original artwork created by university student artists. The show will feature hundreds of pieces of art from students all over Texas. Consistent with ASA’s mission, 5% of each sale will be donated back to the student’s university art program. While you shop enjoy complimentary beverages during happy hour! About ArtStartArt: Founded in 2018, ArtStartArt (ASA) is an online marketplace committed to making it easier than ever to purchase original artwork from the best student artists at top universities across the country. Every month ASA introduces a new collection of art, hand selected by knowledgeable curators and available for a limited time only. The marketplace is proud to give five percent of each sale back to student art programs. For more information visit ArtStartArt.com and follow along on Instagram and Facebook.